My husband and I have been together for a little over five years now. We started dating in July of 2007, and by time the year was up, we had already moved him from his apartment in Cincinnati to my apartment in Columbus. At the beginning of 2008, we bought and moved into a condo in the same neighborhood so that we could have enough space for our combined belongings. From January 2008 to July 2010, we had a place that we really loved. A place where we could put up a big tree for Christmas every year. In July of 2010, I moved us to Dallas Texas, and we were in a tiny apartment. Thus was the birth of our "Apartment Tree." The big one didn't fit anywhere, so we bought a miniature tree and miniature ornaments to decorate it. In 2011, we moved to a larger townhome across the city, so we brought out the big guy again. 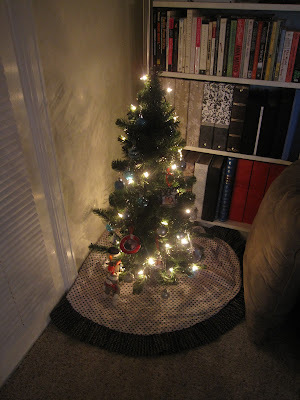 But this year, as we find ourselves in yet another too-small-for-us apartment in Colorado, we are glad that we didn't donate the mini tree after its stint in Texas. Isn't it cute?